has been realized in partnership with 3 Research Institutes and 4 other companies. It was supported for over 1.6 million euros (in front of a cost over 2.4 million euros) by the Apulia Region, with funds from the European Community. supports personalized treatment processes, in case of pathological conditions. 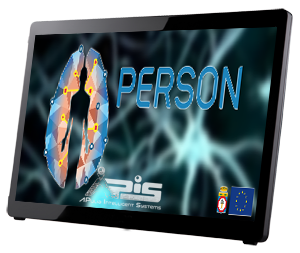 The developed tool is targeted to older people with moderate or medium cognitive decline, and supplies an experiential and immersive experience, linked to real-life situations where interaction with the user occurs through gestures, recovered and reconstructed through an artificial vision set up that avoids the use of input devices that are not familiar to the patients (mouse, joystick …). Read more, surfing on www.progettoperson.it. Click on the icons to see the technical deliverables (in Italian) produced during the project.